I don't travel to Connecticut for weddings all that often but when I do, it's always something a little extra special. I met Catherine and Jesse in the Fall, about 6 months ahead of their May wedding. At once I knew I was in for a fantastic day from the start. The ceremony was to be held at the brides high school in Milford, CT. Her decision to hold the ceremony at a place with such importance to her made the moments and rituals of preparing for the day all that much more personal. 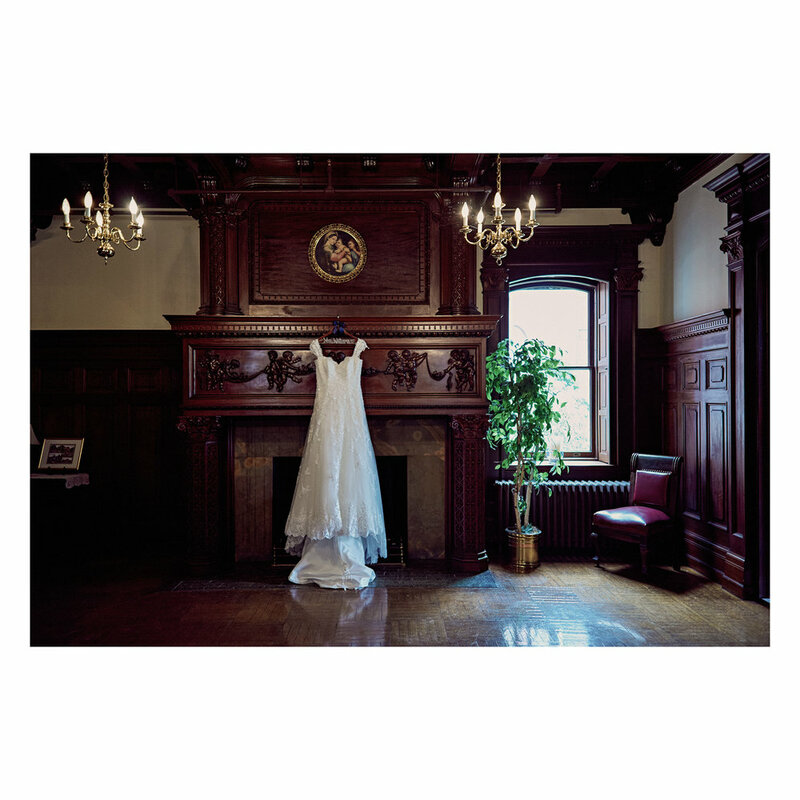 The chapel, where the ceremony was held, and the preparation room, where the girls all got ready, brought back memories and emotion that brought the bride to almost tears throughout the morning. Once I arrived on the day of the wedding, the girls were all in great spirits and excited for the day. 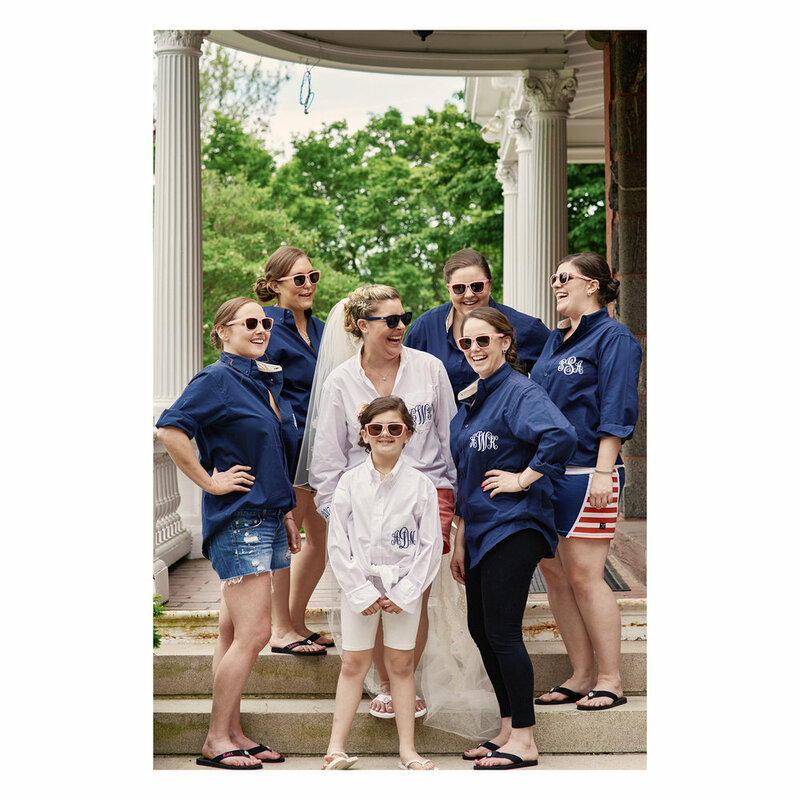 The bride had purchased matching, embroidered button-up shirts for all her bridesmaids as a gift but these also made for great photos before they all got dressed. In the photos below, you can see their transformations and also the elegance of the school that provided an overall elegance to the images that's hard to argue with. The bride and groom shared a moment together through a doorway before the ceremony. Each had written a note to the other and read them aloud will holding hands. Staying in the tradition of not seeing each other before the ceremony, this small exchange helped relieve some of the jitters while getting some comfort from simply touching their future spouse. After that sweet moment, the ceremony was about to begin. With the groom, groomsmen and guests waited in the chapel, the ladies made their way through the labyrinth of the historic private school to the chapel on the third floor. A deep breath was had by all before entering. Laughs and fun exchanges during the religious ceremony helped keep the mood light and showed the genuine love these two had for the other. After vows were exchanged, the couple sealed their commitment with a kiss and also by ringing a bell. After the ceremony, we all gathered in the beautiful landscape in front the the entrance to the school for family and wedding party photos. The bridesmaids were all in a navy blue, floor length gown that fit with the style of the venue perfectly. The men wore grey suits, with the exception of the groom who wore a dark navy blue, and a tie that matched the bridesmaids. The bride wore a sweetheart neckline, a-line wedding dress with gorgeous lace cap-sleeves that flattered her body shape. She was absolutely stunning! After the formal photographs were completed, we ventured on to the reception venue. 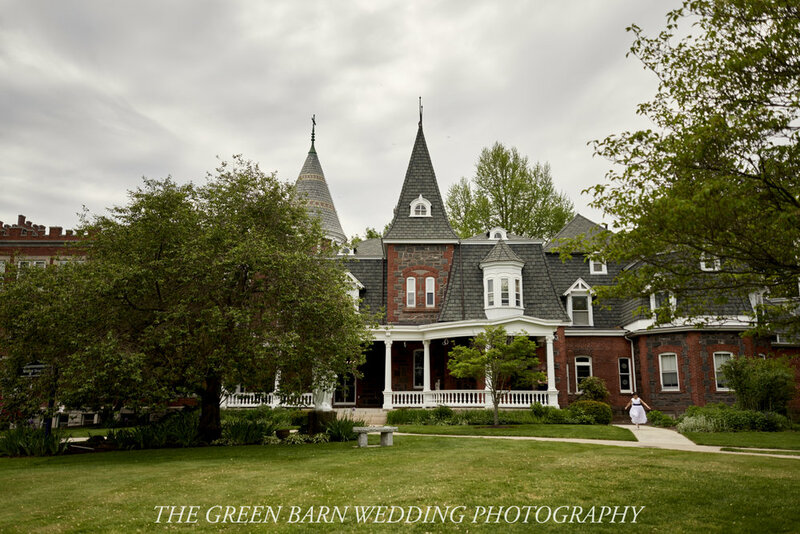 The Spinning Wheel, located in Redding, CT, was also a very special place to the bride. Her parents had their wedding reception at the same exact venue! What a great idea and moment to share with family. The venue had the most gorgeous late afternoon light which I took full advantage of doing the couples portraits. The families of both the bride and groom enjoyed the fantastic food, drinks and, or coarse, wedding cake as the night went on. The dance floor was filled to the brim making for fun and exciting photographs all night. During the toasts and parent dances, there was a smile on every face. What a fantastic night! Thank you to Jesse and Catherine for letting me be a part of their unforgettable day!